That’s National Novel Writing Month. Or, that’s how it’s been for me during the last few years. Really, every year is different. Different people participate and are available at different times. Even the novel I choose paints the month with its own unique color that makes the following year feel so different in comparison. This year I’m working on the most realistic storyline I’ve had since my first year in 2008. There aren’t any murders in this story — no one gets kidnapped or otherwise threatened. There are no fast-paced chases by car or on horseback or people lost in the woods or trapped on the side of a cliff, and there aren’t even any mysteries to solve or literal villains to fight. That might make it sound kind of boring, but I’m excited about it because it will stretch my creativity. It’s easy to portray the motivation of people in harm’s way — they just want freedom or safety or the return to normalcy. Dealing with people in their everyday lives is more difficult — for me at least. It takes more effort to pave out all the little subplots when the characters already know each other. This was what I decided was the failure of my first book — that and the fact that I didn’t work out the characterization before starting to write the book. But even that book — about people who work in a coffee shop — had its share of trouble: an armed robbery, an abusive boyfriend, a kidnapping, and a couple of vicious assaults. But I told myself the experience was failed from the beginning because I was portraying characters at work day after day — or something. After that, I started sending my characters on vacation. In 2009, my character Darby went on a one-woman trip to Wyoming where she met a man, stumbled on a mystery, and ultimately found her path in life among the mountains of the Grand Tetons. In 2010 I traveled to Hollywood (from the comfort of my writing desk) to tell a crime thriller about the judges of a singing competition kidnapped by someone who threatens their lives if the show doesn’t go on without them. The next year I wrote a horror thriller set in the Smoky Mountains, where my characters meet a psychopath while camping in the woods. Last year I left earth entirely to write of a princess in a Medieval-style time fighting to save her kingdom. And now I’m back on earth, back in small-town America, where a mother and daughter are just taking it one day at a time. And so am I, for that matter. It’s been slow-going. I’m about 5,000 words behind where I should be, though I’m hoping the coming weekend will help close the gap. The main problem I’m finding at the moment is working in subplots, because I really don’t have any. With a whole host of characters — brother-in-law, his wife, their 16-year-old twins, best friends, coworkers, and a town full of potentially quirky people — there doesn’t seem to be anything going on, and when people talk to each other about their problems it seems so scripted because in real life they would already know each other’s business. Maybe I’ve been approaching it all wrong, writing from Kate and Corey’s perspective. Little vignettes of townspeople should liven things without requiring I abandon my third person limited back and forth between the two leads. To see how that works out, check out the Facebook page of my main character, Kate Tresler, where you can be a part of this book through commenting on her posts. Five years ago — before I wrote the fantasy novel, the horror, the crime thriller, the chick lit, or the mainstream coffee shop story, I wasn’t nearly as interesting. 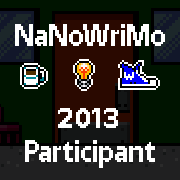 I’ve blogged about the NaNoWriMo experience before, and last year a coworker and I even chronicled our parallel experiences for the newspaper where we work. But what I’ve never done is keep a Facebook page for my main character and invite others into my story. On Facebook, if you friend Kate Tresler, you’ll be able to follow along with the progress of the storyline, as Kate tells it. She and her 9-year-old daughter Corey are figuring out how to celebrate their first Christmas without Jake, who died six months ago. Kate wants to dive into the holiday craze — she wants to drown in tacky. But Corey has other ideas. In church she was told Advent should be a more solemn time of preparation and renewal — more like Lent. Could you imagine December without carols, gift buying, card giving, parties, candy canes, and sleigh bells? Yeah, neither can Kate. But she’s willing to humor Corey. How long could it last, right? She’ll snap out of it after a week or two. Right? It’s called “Advent,” and it’s my first Christmas story, so feel free to stop by and see what Kate’s up to. Almost like a behind-the-scenes peek of the book, you’ll get more than what’s in the book. It will be like you’re a character too, watching how the plot unfolds from the perspective of Kate’s online interactions. And please join in the conversation too. But be careful; you might end up in my novel.